SXSW Interactive 2009 Sketchnotes are Posted! 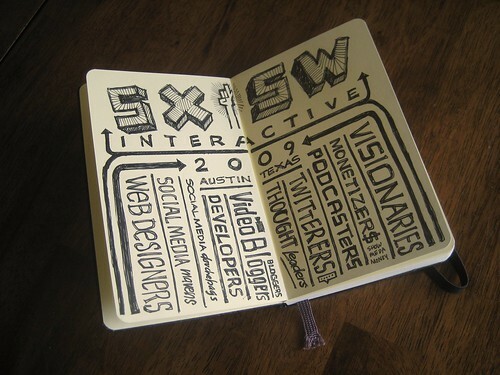 I've just finished processing and posting 70 pages of sketchnotes from SXSW Interactive 2009 on Flickr. This year I doubled the amount of pages I was able to capture to 70, up from 34 pages of sketchnotes in 2008. Having done more sketchnotes since last year helped as did my position of official SXSWi sketchnoter. Thanks to Hugh Forrest and Shawn O'Keefe for giving me the opportunity to live sketchnote this year's festival and design the tote bag. I had a great time at SXSW Interactive again this year. I met many new people, bowled with friends at the Avalonstar Bowling Extravaganza, wandered the streets of Austin, Texas and received great feedback on my SXSWi '09 Tote Bag Design. 20x2 Live Sketchnoting from Mike Rohde on Vimeo. Mike, these are fantastic! Thank you for sharing them with everyone! Damien, thanks! I'm glad to share. great stuff, getting better every conference. glad we got to catch up, even if it was on the last day. @DK, always happy to share! Enjoy. I'd buy it! Release it as a book through Blurb or LuLu! Yes, I was just about to suggest you putting all these precious notes into a Blurb book!!!! Wow. So impressive. You need to start doing these for lots of conferences and events. Definitely a collectors item. Does SXSWi have a "conference-in-a-box" option? It would be cool if this were included in that box! Incredible stuff. I liked sifting through your sketchnotes and I dig your handwriting. Just out of curiosity, what pen do you use? @Yuki Cool, thanks for seconding the motion. Question: would you like to have additional background notes included in the book along with the sketchnotes themselves? That's what I was thinking of doing anyway. @Gerard I've been going to several now, and hope to be hired to come to others this year as well. I've focused mainly on web design and development events (since I know the topic well) and I'm not sure how interested I might be in say an Insurance Conference. But maybe that's a way to learn more about other areas. Thanks for the encouragement! @Montoya SXSWi doesn't have a 'conference in a box' as of yet, though we talked very generally about the idea. I'll have to mention it to them as an option for 2010 maybe. @Sean Glad you like the sketchnotes and my handwrriting. People keep asking me to make fonts out of my sketchnote lettering and I'm pondering that idea. Pen is usually Pilot G2 0.7mm but this year I tried a Zebra Sarasa Gel 0.7mm and really liked it. I love your notes, absolutely beautiful. thanks for sharing! Thanks Ulrike! You are very welcome. Great pics, Mike! V. inspiring. Might I ask, what did you use for these sketches? I looked at your design kit, but only saw mechanical pencils. Whatever pen it is, it looks fantastic. Thanks! 1. A 0.7mm gel pen, in this case a Zebra Sarasa, but often it's a Pilot G2. 2. Pocket Moleskine sketchbook (nice, thick paper is critical to avoid bleed through). @starquest, thanks for the kind words!